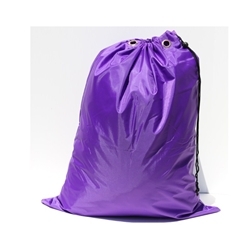 This is our 22"W x 28"L purple laundry bag which feature a draw string cord & lock closure. The bag also has 2 metal grommets that are used to hang the bag from a hook. Many cleaning companies hang the bag up on a hook behind their counter. This laundry bag is made of heavy polyester material.